Equipping your business with products essential for routine janitorial tasks like; dusting, sweeping, mopping and refuse removal, our Janitorial range includes; cloths, dusters, brooms, dustpan and brush sets, colour-coded mop systems, bins and 100 per cent recycled refuse sacks. The aim of a janitorial colour-coding system is to prevent cross-contamination during the cleaning process. If a single mop was used to clean every floor in a restaurant, bacteria could spread from the washrooms and front of house to food preparation areas. If a single cloth was used to wipe all food preparation areas, bacteria from the preparation of raw meat could spread to other areas in the kitchen. Applying a colour-coded system to separate areas is the most effective way of reducing the risk of cross-contamination. For this system to work, you will need to assign different colour-coded janitorial supplies to each area, including mops, cloths, brooms and gloves. Why use a colour-coded cleaning system? 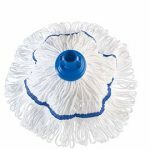 Connecting your mop head to the handle is easy, but if done incorrectly, it will result in the mop head disconnecting when you are mopping. Our janitorial range includes a multi-fit connection handle, which allows users to easily change mop and broom heads to suit the application. The handle features a screw end; however, it can also be used as a standard push mop for most mop heads. There are a variety of refuse sacks and bin liners available to catering operators, choosing the correct sack for your business will help you control costs and manage your waste safely and hygienically. Before you choose your refuse sack there are a number of factor you should consider carefully. All refuse sacks within our Janitorial range (branded THE GREEN SACK™) are made from 100 per cent recycled polythene. These refuse sacks are manufactured from agricultural polythene waste, like crop covers and bale wraps, that would otherwise be sent to landfill. 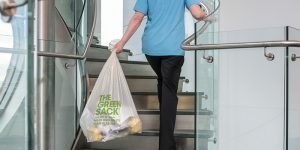 THE GREEN SACK™ has a carbon footprint 35 per cent lower than most other refuse sacks on the market, and are available in a range of sizes and strengths; from light duty to extra heavy duty. All refuse sacks within our Janitorial range (from our partner supplier bpi recycled products) come with CHSA endorsement, giving our customers full confidence that refuse sack specifications are correct as labelled. The CHSA represents all the major manufacturers and distributors, from global multinationals and national networks to privately owned independent businesses. All CHSA members adhere to the code of practice and the Manufacturing Standards Accreditation Schemes for soft tissue products, plastic refuse sacks and industrial cotton mops – this has driven up standards and ensures that customers get what they are expecting and paying for. 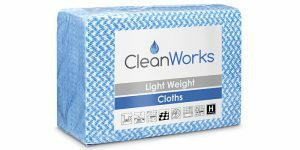 Cleanworks is a range of disposable cleaning cloths and scourers providing hygienic solutions to all wiping tasks. It is important that foodservice operators use cleaning cloths that are clean and hygienic and not contaminated with potentially dangerous bacteria. 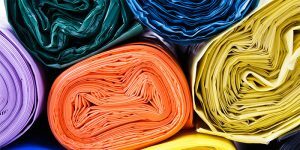 The recommended advice is to use disposable cloths and change them regularly, as well as using separate, colour-coded cloths for different areas. 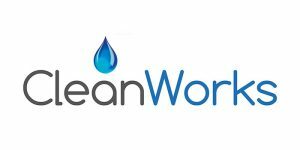 Cleanworks cleaning cloths are available in four colours for different applications or areas in the kitchen – to minimise the risk of cross-contamination in food preparation areas where raw meat is processed. Robert Scott is a family run cleaning brand based in the beautiful Saddleworth Valley. Since 1925, Robert Scott has been running some of the last working cotton mills in Lancashire, passionate about its made in Britain tradition. 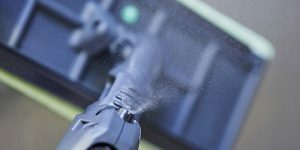 Designing and manufacturing a professional range of high quality janitorial products, Robert Scott helps operators in the catering and hospitality industry implement easier and more efficient cleaning solutions. Because of our serious cleaning know-how, we are trusted by our customers to deliver products that make light work of the toughest cleaning task. RPC bpi refuse is the UK’s largest manufacturer of refuse sacks, producing over 30 million refuse sacks per week in the UK and is Europe’s largest recycler of waste polythene. We are committed to innovation, continuously investing in machinery, technology and creating new products to stay ahead of the competition, as well as meeting the evolving needs of customers, whether helping to save money or reducing the carbon footprint. 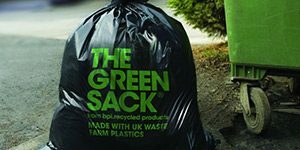 Our Green Sack™ range is 100 per cent recycled refuse sacks, which are the toughest, greenest UK manufactured refuse sacks currently available for the UK market. We have launched three new Bunzl Catering Supplies exclusive promotions on products from Rubbermaid. In hotels, the major part of revenue comes from the rooms, so housekeeping is a top concern. Turning coffee grounds into a microfibre mop! The ULTIMATE 3D S.Cafe mop from Decitex is made from used coffee grounds. New to the Cleanworks janitorial range from Bunzl Catering Supplies – the Wizard cleaning sponge is a nifty new product that removes dirt and marks where traditional cloths and scourers might fail.